The majority of systems that control our daily lives rely on software. Often this software is embedded in the device and remains invisible to users. While the consequences of a failure may be minor, such as failing to deliver part of the requested service, they may also be dramatic, possibly causing human injury or even fatalities (eg car crashes or train collisions). In recent years, CETIC (Centre d'Excellence en Technologies de l'Information et de la Communication) has devoted significant effort to the development of industrial methods and tools that target safety-critical software, with a specific focus on the early phase of system development. At this level, the consequences of design flaws are the most dramatic and costly to correct. Large studies like Chaos (Standish Group) have also shown that these flaws remain the principal reason for project failure. To improve this, the following topics, illustrated in Figure 1 using the V reference model, are being investigated from a model-driven engineering perspective. Figure 1: Scope in the V-model. 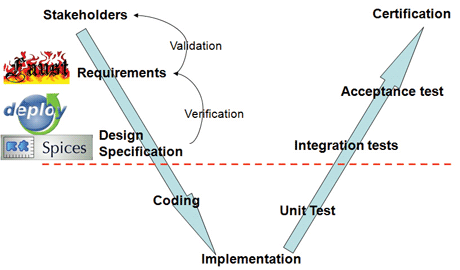 At the start of the life cycle, rigorous engineering of requirements aims to provide adequate methods and tools to capture, formalize and perform early verification and validation of critical requirements. Immediately following this, a strong connection with industrial development methodologies is required. Good candidates are Event-B/B (a generic proof-oriented formal language) and AADL (architecture description language). At the other end of the life cycle, the certification process should support adequate techniques for a high level of assurance. acceptance test generation, based on the coverage of the system properties, especially those most critical. Ensuring full traceability is critical in order that changes can be tracked and their impact assessed. It is therefore necessary to connect requirements models with more refined models at system and specification levels. While this connection can be loose, using simple traceability techniques, richer models enable a more elaborate and automated connection, or even the derivation of some design artefacts from the requirements level, hence reducing the effort required to produce and maintain them. This is currently being investigated in two projects with quite different approaches. First, the FP7 DEPLOY (industrial deployment of system engineering methods providing high dependability and productivity) project aims at the industrial deployment of the Event-B method, a system-level variant of the B method. This method is quite generic and is being applied in sectors such as automotive, train, space and even e-business. Like B, it is mainly proof-based. It is supported by the RODIN (Rigorous Open Development Environment for Complex Systems) proof environment which is Eclipse-based and includes plug-ins for model-checking (ProB) and animation. Bridging the gap between requirements and Event-B models has been identified as a major topic. Second, the ITEA2 SPICES (on Support for Predictable Integration of mission Critical Embedded Systems) project is domain-specific: it targets embedded systems and relies on a formal architectural description language called AADL. Verifications are oriented towards real-time properties and resources management. 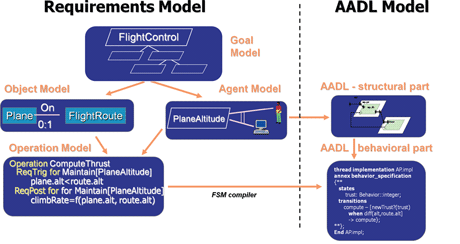 The connection with requirements models is currently developed both for the structural and dynamic parts of AADL, as shown in Figure 2. Again, Eclipse-based tools are available (TOPCASED). Figure 2: Requirements (KAOS) to AADL mapping. Systematic certification is required for safety-critical systems. A generic standard such as IEC-61508 defines safety integrity levels and guidelines. These generic guidelines are refined in more sector-specific standards such as space (ECSS - European Cooperation on Space Standardization), aeronautics (DO-178B) or railways (CENELEC 50126/8/9 - European Committee for Electrotechnical Standardization ). Most of these also define a number of assurance levels in direct connection with risk (probability and impact). Higher assurance levels require a more formal demonstration of correctness. Formal models, which support the rigorous development of the system, can also directly support the certification process. This means not only that the effort required for certification is not increased for such systems, but that the perception of the certification process is also improved, since it is seen as being better integrated with the system products and not as additional work. Our current work mainly targets the aeronautics domain.